In this powerful debut novel, an alcoholic ex-con man grandfather, his restless, philandering seafood salesman son, and his hopeful musician grandson struggle to make up for their past and somehow set course for the future. In the past, the grandfather has hustled for money; now he's hustling for redemption. The son has hustled for women; now he's hustling for love of a different sort. His son, Chris, is hustling to be a famous musician with enough money to solve his family's unsolvable problems. Chris's coming-of-age story explores the ways people struggle to fulfill their wants and desires-and what they are willing to sacrifice to feel free. Some human truths need to be presented without embellishment, and the central truth of Hustle is that we’re all on the edge of a cliff. This is a fine story, honestly told. Hustle succeeds at what many authors attempt but ultimately fail to achieve: prose that is both gritty and gleaming, characters raw and still real, and a story that hustles your heart and gives it back to you. 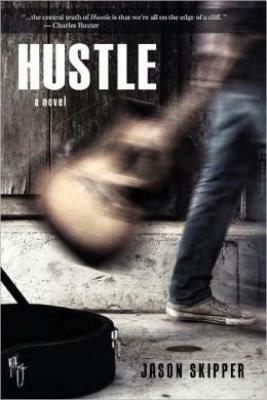 Hustle is a deeply felt and illuminating look at the trials of adolescence, hard enough to begin with and bordering on frontier justice when compounded by poverty, addiction and mental instability. I can’t remember the last time I read a book with a coming of age story that was so gut wrenching and heart breaking as the one presented in Hustle by Jason Skipper. One of the best reading surprises I have had in 2011. A more than solid coming-of-age story. A superbly nuanced and captivating debut. This is a great book about growing up and learning to take care of yourself, no matter what the cost. Without question a great story.